Economics With Alex: More Economics-Based Pizza Shenanigans! Warning! There might be major flaws in my reasoning. If so, please point them out in the comments. What would happen if a group of people were to contribute money to a fund to buy pizza, and there was an agreement to split the pizza equally? (People eating pizza together can obviously divide it up according to how much money each person contributed, or by how hungry each person is, but we shall use the simplification of equal distribution, for illustrative purposes.) This is the flip-side of my Joey and Chandler Theorem, where the costs of each participant were the mean of the group. In this case, the benefits for each participant (slices of pizza) will be the mean of the group. Notice that Rachel's demand has just become more elastic. To understand this intuitively, lets think of what would happen if the price of a slice of pizza were to increase by $0.50. Rational consumers would consume less. Now what if the price of half a slice of pizza were to increase by $0.50? Rational consumers would consume even less than in the first situation. What if the price of a slice of pizza were to decrease by $0.50? Rational consumers would consume more. What if the price of half a slice of pizza were to decrease by $0.50? Rational consumers would consume even more. This is what is happening with Rachel's demand function. For every slice of pizza she orders, she will pay the full price, but only get to consume half of it. Thus she will be more sensitive to changes in price. Let's say that pizza is sold by the slice for the price (P) of $1. Let's also say that Rachel will contribute money to buy pizza before Monica does. But this function only applies if Rachel knows how much Monica will order. If Rachel puts her money down first, she will have to use her expected value of what Monica's order will be: E(Qm)r. The person who puts his/her money down first clearly sets the tone. Let's say Monica has an identical demand function to Rachel, and that Rachel expects Monica to order 3 slices of pizza. Let's see what will happen. So, Monica will order 3 slices of pizza. But both Monica and Rachel will be splitting the pizza equally, eating 4 slices each. So, Rachel ends up paying for one of Monica's slices. ...5 slices of pizza, just as Rachel had ordered the time before. Because she gave a low-balled contribution to the pizza pool, Rachel has cheated Monica out of $1. This method of low-balling has a risk, though. If Rachel misjudges how hungry Monica is, she might end up with less pizza than would maximize her utility. In a situation like this, where costs are borne independently, but benefits are shared, the expected or actual value of what one's friend, or friends will order does something to one's demand curve. If friend A knows, or is otherwise convinced that friend B will order a higher quantity of pizza than friend A would order independently, to take advantage of this, friend A will shift her demand curve inward, and order less pizza than if she had simply been ordering by herself. 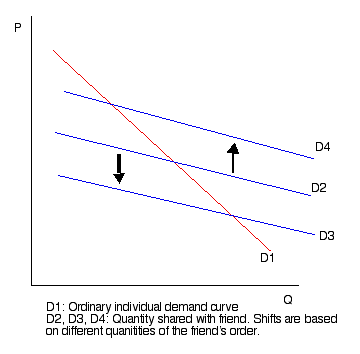 And if friend A knows or is otherwise convinced that friend B will order less than friend A would order independently, to make the most of this unfortunate situation, friend A's demand curve will shift outward. For some reason the latter rule, to me seems less intuitive. But, the demand curves, with their shifting intercepts, do not lie. Or do they? Let's get away from this algebra, and into some real life. No, the demand curves do not lie, but they are incomplete. For one thing, we must realize that these demand curves only represent the behavior of people who would choose to enter into a benefit sharing agreement. In reality, there are many other alternatives to splitting pizza with people, like getting pizza on your own, and I can imagine that many would find that arrangement more desirable than sharing. Also the price of pizza is not the only cost one pays for when pizza is ordered, and the quantity of pizza is not the only benefit. There are psychological costs and benefits as well. For example, if one does not pitch in enough money for the pizza, one might be stigmatized as a cheapskate, jerk or loser. If accountants could look into the minds of people ordering pizza in this way, they could make debits for "being called a cheapskate expense", "guilt over cheating one's friends expense" or credits for "perceived generosity revenue". But the human mind is hard to penetrate. Nonetheless we should understand that forces other than price and quantity are at work here, which is why people do not necessarily act in the ways shown on the graphs. Economic models (much like fashion models) do not have wrinkles, but real life is full of them.